The Kentucky Hospital Research and Education Foundation, Inc. (KHREF) was established by KHA in 1968. 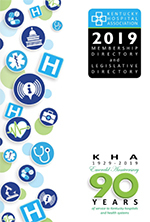 It is a tax-exempt 501(c)3 entity and houses activities related to health care workforce expansion efforts and educational offerings for KHA members. KHREF administers several grants including the Hospital Preparedness Program, Small Hospital Improvement Program and State Rural Hospital Flexibility Program. KHREF hosts multiple educational seminars and conferences throughout the year. Many events provide opportunities for hospital executives and staff members to earn continuing education credits (CEUs), ACHE face-to-face credits or continuing legal education credits (CLEs). View our calendar of upcoming events to see what we have planned.